The Union Minister for Defence, Smt. Nirmala Sitharaman, the Union Minister for External Affairs, Smt. Sushma Swaraj along with the US Secretary of Defence, Mr. James Mattis and the US Secretary of State, Mr. Michael R. Pompeo just before the start of first ever '2+2 Bilateral Dialogue' between the two countries, in New Delhi on September 06, 2018. The first ever Indo-US 2+2 Dialogue finally took place on September 6, 2018 after two postponements over past one year. US Secretary of State Mike Pompeo stated on September 5 that India buying Russian S-400 and oil from Iran would not be "primary" focus of the dialogue. It may be recalled that in 2016, the US had accorder 'Major Defence Partner' status to India. EAM Sushma Swaraj received US Secretary of State at the airport on arrival while Defence Minister Nirmala Sitharaman welcomed Defence Secretary Jim Mattis at the airport on arrival at New Delhi. Speaking to journalists, Pompeo termed India as "true strategic partner". General Joseph Dunford, Chairman US Joint Chiefs was also part of US delegation. Sushma Swaraj had separate bilateral meeting with Pompeo while Sitharaman had one-on-one meeting with Mattis before the delegation-level 2+2 Dialogue. During the bilateral and delegation-level dialogue, the two sides recognized their strategic partnership, commitment to work together on regional and global issues, including in bilateral, trilateral, and quadrilateral formats. The two sides decided to establish secure hot-lines between the Indian EAM and Defence Minister and their US counterparts. Discussions were wide ranging covering the geopolitical and geostrategic developments including in the Korean Peninsula and the Af-Pak region. Pompeo emphasized that "all countries in Asia and south-east Asia can benefit from a free and fair Indo-Pacific and that will be our priority." The US acknowledged India's longstanding and ongoing contributions of economic assistance to Afghanistan and also welcomed India's enhanced role in Afghanistan's development and stabilization. The Indian side brought up the issue of terrorism by Pakistan. Both sides affirmed increased bilateral counter-terrorism cooperation; information-sharing efforts and at international for a, and support for a UN Comprehensive Convention on International Terrorism. The joint statement called upon Pakistan to stop exporting terror. There was also talk of maintaining pressure over Dawood Ibrahim – indicating India refuses to develop a spine and fight such wars itself. Jim Mattis said, "We will continue working together, join hands and expand India's role as a primary major defence partner, to elevate our relationship to a level to commence with our closest allies and partners". A high point of the dialogue was signing of the Communications Compatibility and Security Agreement (COMCASA) that will: allow both countries to share high-end encrypted communication and satellite data – implying whatever is detected by US warships or aircraft will instantly get transmitted to Indian Navy on secure encrypted channel, and; the agreement provides legal framework for high-end defence technology transfer – for example, India can acquire Sea Guardian drones to detect and target enemy vessels. Indian and US officials had debated COMCASA in 2007 but it had then not been cleared by the Cabinet Committee of Security (CCS). Since then, the two sides had been working on the revised text of the agreement. 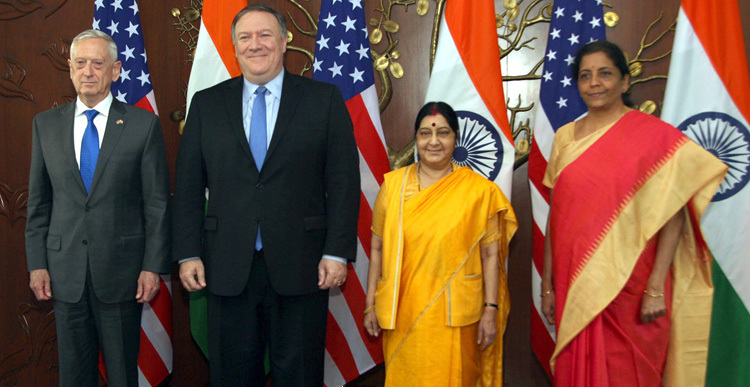 While Pompeo termed COMCASA a "milestone" in the relationship, Sitharaman asserted that the pact will enhance India's defence capability and preparedness. Readiness was announced to negotiate an Industrial Security Annex (ISA) that would support closer defense industry cooperation and collaboration. A joint decision was also taken at the dialogue for US and Indian militaries to carry out large-scale joint exercises next year; simultaneously in the air, on the land and at sea. The two sides further reaffirmed their commitment to ongoing and future cooperation to ensure a stable cyberspace environment and to prevent cyber-attacks. Sushma Swaraj also discussed the contentious issue of the H1B visa with Pompeo. The US reiterated full support for India's immediate accession to the Nuclear Suppliers Group. Both sides committed to further expanding and balancing the trade and economic partnership consistent with their leaders' 2017 joint statement, including by facilitating trade, improving market access, and addressing issues of interest to both sides. The next 2+2 Dialogue is to be held in the United States in 2019. There was no official mention of the S-400 Triumf India is acquiring from Russia but Pompeo told reports after the dialogue, "Our effort here is not to penalize a great strategic partner like India", adding that Washington was also working with New Delhi to tackle the issue of India's oil imports from Iran. Before the dialogue, media had brought out that Indian concerns would be conveyed to the US side. Presumably, these would have been discussed in the bilateral discussions between Swaraj-Pompeo and Sitharaman-Mattis. Last month the US Congress had already paved the way for waivers to India by passing the conference report on National Defence Authorization Act-2019 (NDAA-19). But individual waivers must be viewed in context of India's needs to balance between Indo-US and Indo-Russian relations which are both strategically important given the dynamics of the Indo-Pacific region, and an aggressive China, even if latter is somewhat holding its horses under shadow of the US-China trade war. Russian officials confirmed at the recent Army 2018 Exercise Su-57 technology for Indian Sukhoi Su-30MKI and MiG is offering a completely new MiG-35 with 50% more combat potential, capable of tracing 30 targets simultaneously and hitting 10 of them together, at 20% less prices than other competitors with transfer of technology (ToT) in response to a request for proposal (RFP) for 110 fighter aircraft for the IAF under 'Make in India' project. There is also the question of US-Pakistan relationship in the 'long-term' based on the premise the Washington's hope that Pakistan will help Taliban reconciliation in Afghanistan and curb terrorist activities, of which Imran Khan may have administered another sweet pill to Mike Pompeo when the met on September 5. Finally, the Indo-US Strategic Partnership is very important but needs accommodation and balance, conforming to dynamics of the region.